This new book first was released in 2012 and now again this year. It is soft cover of 487 pages in 6 3/4" x 10" page format. The cover art shows a Vulcan in a takeoff run against a background of a technical drawing. The back cover has a color photo of the Author standing next to a Vulcan. There are 503 black and white photos in the book. The vast majority of these of the Vulcan, 153 line drawings to no scale, many data lists and 5 illustrations of instrument panels in the Vulcan. This is a very therough book about this aircraft and a great picture album. 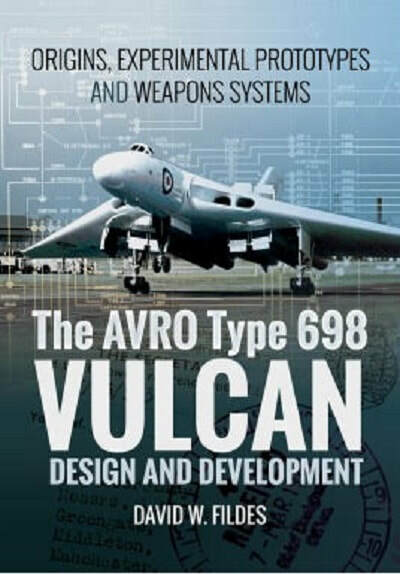 An icon of the Cold War era, the Avro Vulcan captured the public's imagination, Its unique delta wing and tailless design was inovative for the time and testament to the forward thinking of its designers. The Avro Vulcan was built to meet a Ministrey of Supply specification for a medium range bomber that could carry a 10,000 lb bomb with a target range of 1,500 nautical miles. It was considered the most advanced design of a tender competition held in July of 1947 to meet specification B35/46 and was selected for further research along with two other aircraft designs. Later, the Avro Vulcan and Handley Page Victor were given approval to be built to the same specification. The Vickers Valiant was built to a less demanding specification, but to the same operating requirement. These three aircraft became part of the United Kingdom's strategic nuclear strike force known officially as the V-force. David Fildes joined Hawker Siddeley Aviation in 1972 after working in the advertising industry. He joined the publicity department then based at Chadderton under John Gray D.F.C. and was responsible for producing publicity material for the Marketing Department and was later involved Public Relations duties for the division. Before taking early retirement in 1995, he was tasked to establish a Heritage Centre at Wooford, now known as the Avro Heritage Museum. It is well established on the former BAE Systems site. His first experience of the Avro Vulcan was in the early 1950's, when his parents took him to Woodford where he witnessed an early test flight which made quite an impression. This book will be of great interest to aircraft modelers and aircraft enthusiasts as well. I want to thank the folks at Casemate Publishing who sent me this review sample and Pen & Sword Books Ltd.